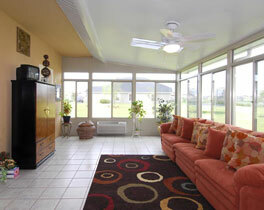 Sunrooms are a beautiful addition to your home, adding value to your property, creating extra space and offering a unique way to enjoy the Southern California climate all year long. 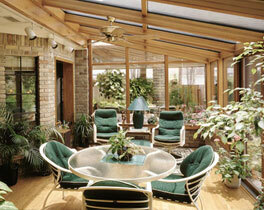 Go to Sunroom Gallery to see more ideas for your dream sunroom, patio room, patio enclosure, solarium, or conservatory. 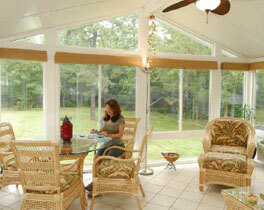 Sunrooms are significantly more cost effective, easier to install, and cause less mess than construction of ordinary room additions; not to mention take much less time to construct. You’ll save money on heating and cooling costs and get to enjoy outdoor living indoors all year long in your spectacular Four Seasons Sunroom. Right now you can save 35% on your sunroom...Fill out our contact form and a representative will contact you with details. 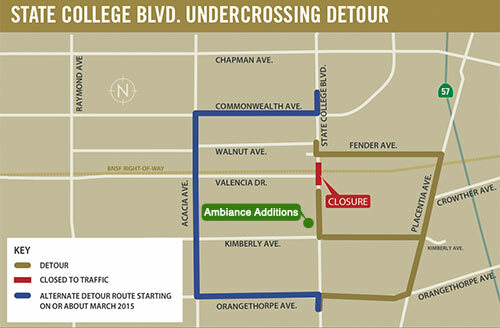 Note: A full closure of the intersection of State College Boulevard and E. Valencia Drive will begin on January 9, 2015. The closure will be in place until approximately summer 2017 to allow crews to build the new bridge. Designated detour routes (see map below) will be in place during this closure. Business access will be maintained.